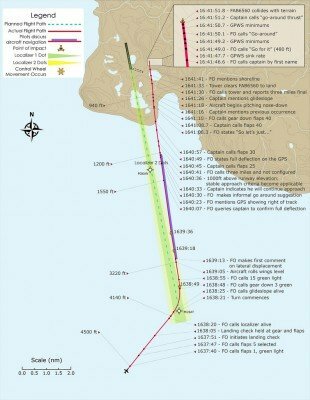 As a result of a fatal Boeing 737 accident in Resolute Bay, the Transportation Safety Board of Canada (TSB) calls on Transport Canada and the airline industry to reduce unstable approaches that are continued to a landing, and to improve crew communications. 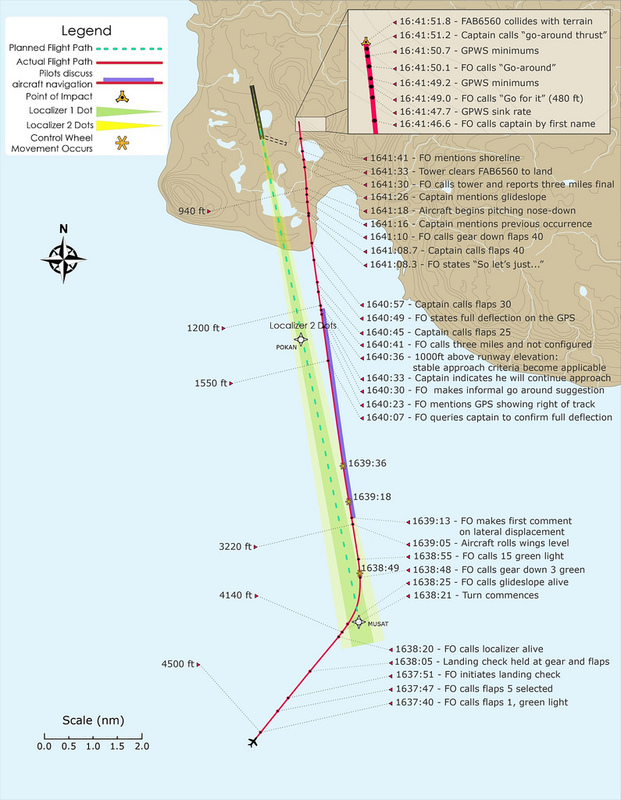 On 20 August 2011, a Boeing 737-210C, operated by First Air, was being flown as a charter flight from Yellowknife, Canada to Resolute Bay, when it struck a hill about 1 nautical mile east of the runway. The accident claimed the lives of all 4 crew members and 8 of the passengers, and left 3 passengers seriously injured. The investigation concluded that a combination of factors contributed to the accident. The aircraft did not intercept the runway localizer (alignment) beam, and instead diverged to the right, and ultimately hit a hill. Fundamental to the Board’s findings is the fact that an unstable approach was continued to a landing. Central to the TSB findings was that, although the 2 pilots were aware they were off course, they each had a different understanding of the situation and did not take corrective action in time. The late initiation and subsequent management of the descent resulted in the aircraft turning onto final approach 600 feet above the glideslope, increasing the crew’s workload and reducing their capacity to assess and resolve the navigational issues during the remainder of the approach. When the heading reference from the compass systems was set during initial descent, there was an error of −8°. For undetermined reasons, further compass drift during the arrival and approach resulted in compass errors of at least −17° on final approach. As the aircraft rolled out of the turn onto final approach to the right of the localizer, the captain likely made a control wheel roll input that caused the autopilot to revert from VOR/LOC capture to MAN and HDG HOLD mode. The mode change was not detected by the crew. On rolling out of the turn, the captain’s horizontal situation indicator displayed a heading of 330°, providing a perceived initial intercept angle of 17° to the inbound localizer track of 347°. However, due to the compass error, the aircraft’s true heading was 346°. With 3° of wind drift to the right, the aircraft diverged further right of the localizer. The crew’s workload increased as they attempted to understand and resolve the ambiguity of the track divergence, which was incongruent with the perceived intercept angle and expected results. Undetected by the pilots, the flight directors likely reverted to AUTO APP intercept mode as the aircraft passed through 2.5° right of the localizer, providing roll guidance to the selected heading (wings-level command) rather than to the localizer (left-turn command). A divergence in mental models degraded the crew’s ability to resolve the navigational issues. The wings-level command on the flight director likely assured the captain that the intercept angle was sufficient to return the aircraft to the selected course; however, the first officer likely put more weight on the positional information of the track bar and GPS. The crew’s attention was devoted to solving the navigational problem, which delayed the configuration of the aircraft for landing. This problem solving was an additional task, not normally associated with this critical phase of flight, which escalated the workload. The first officer indicated to the captain that they had full localizer deflection. In the absence of standard phraseology applicable to his current situation, he had to improvise the go-around suggestion. Although full deflection is an undesired aircraft state requiring a go-around, the captain continued the approach. The crew did not maintain a shared situational awareness. As the approach continued, the pilots did not effectively communicate their respective perception, understanding, and future projection of the aircraft state. Although the company had a policy that required an immediate go-around in the event that an approach was unstable below 1000 feet above field elevation, no go-around was initiated. This policy had not been operationalized with any procedural guidance in the standard operating procedures. The captain did not interpret the first officer’s statement of “3 mile and not configged” as guidance to initiate a go-around. The captain continued the approach and called for additional steps to configure the aircraft. The first officer was task-saturated, and he thus had less time and cognitive capacity to develop and execute a communication strategy that would result in the captain changing his course of action. Due to attentional narrowing and task saturation, the captain likely did not have a high-level overview of the situation. This lack of overview compromised his ability to identify and manage risk. The crew initiated a go-around after the ground proximity warning system “sink rate” alert occurred, but there was insufficient altitude and time to execute the manoeuvre and avoid collision with terrain. The first officer made many attempts to communicate his concerns and suggest a go-around. Outside of the two-communication rule, there was no guidance provided to address a situation in which the pilot flying is responsive but is not changing an unsafe course of action. In the absence of clear policies or procedures allowing a first officer to escalate from an advisory role to taking control, this first officer likely felt inhibited from doing so. The crew’s crew resource management was ineffective. First Air’s initial and recurrent crew resource management training did not provide the crew with sufficient practical strategies to assist with decision making and problem solving, communication, and workload management. Standard operating procedure adaptations on FAB6560 resulted in ineffective crew communication, escalated workload leading to task saturation, and breakdown in shared situational awareness. First Air’s supervisory activities did not detect the standard operating procedure adaptations within the Yellowknife B737 crew base.